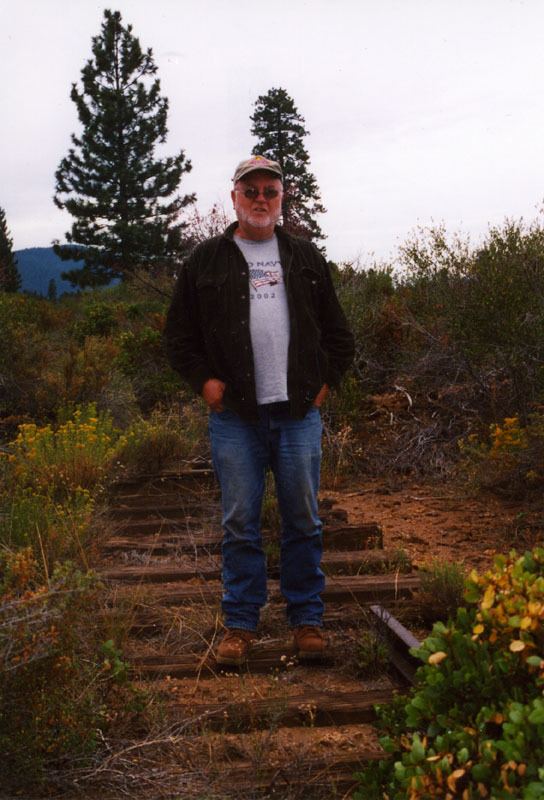 On July 5th, 2011, the McCloud railroad and community lost an icon when Malen Johnson passed away unexpectedly in a Redding hospital at the age of sixty-nine. 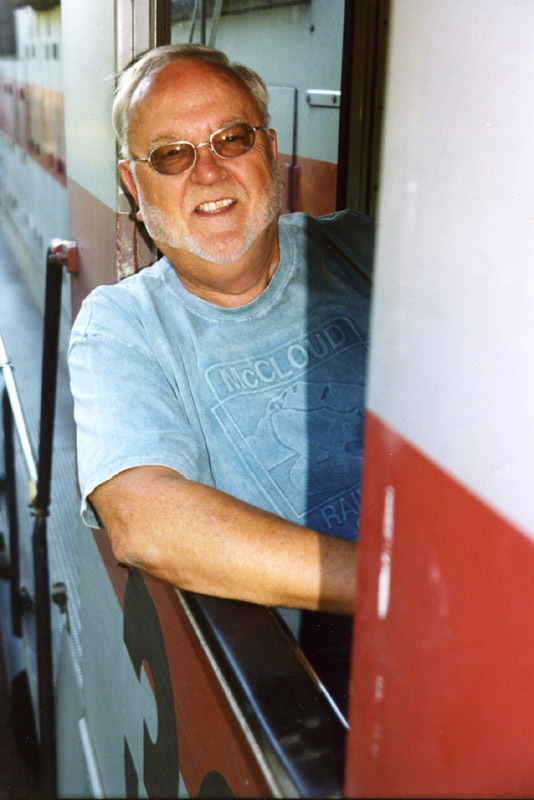 Malen at the controls of a dinner train in January 2008. Jeff Moore photo. The Johnson family ran a long-established ranching and farming operation in northern California, with winter range in Red Bluff and summer range around McCloud. In 1929, the McCloud River Lumber Company sold its ranch land south of town to the Johnson family, who raised hay on the property in addition to using it as a base for their cattle and sheep operations. Andrew Johnson ran the operation until his death in 1935, at which point the property transferred to his four sons. Two of them, Silas and Malen, ran the ranch from that point forward. 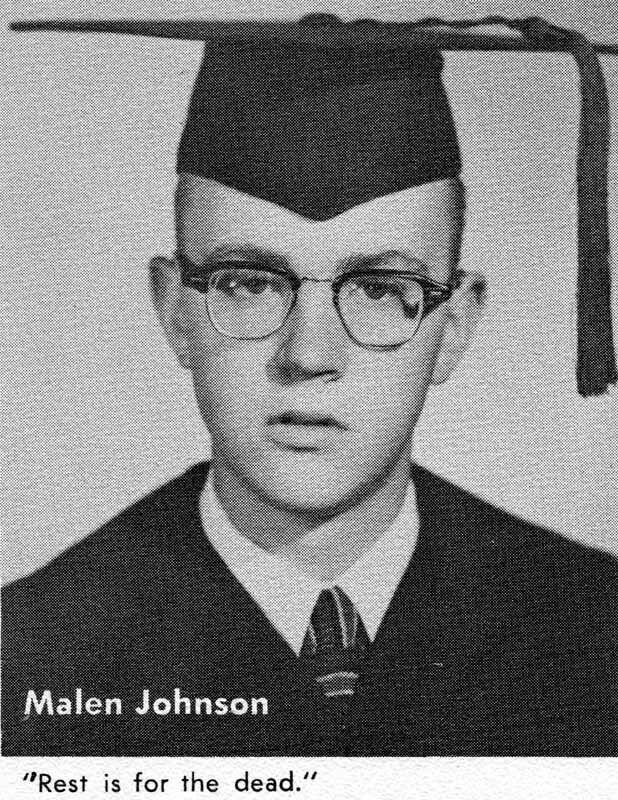 Malen and his wife Mary welcomed Malen Johnson Jr. into the world on January 13, 1942. Malen split his youth between Red Bluff and McCloud, and as he put it to me, it didn't take him long to figure out where he wanted to live. Malen graduated from McCloud High School in the spring of 1959. His senior quote was "Rest is for the Dead"; on another page, he listed "Rancher" as what he would like to grow up to be, with "Cowboy TV Star" as what he would more likely end up doing. Malen's high school yearbook photo. Roger Titus collection. McCloud was still a company town at the time, and Malen was one of the very few graduates from McCloud High School who was not the child of a McCloud River Lumber or McCloud River Railroad employee. The lumber company at the time had a special program under which they would hire any local children who were willing for various summer jobs, and after graduation Malen joined the flock of his fellow graduates into the lumber company offices to see what they had available. What Malen didn't know at the time was that his father was then in the process of suing the lumber company for damages done to the family's land by a recent logging operation, and as Malen put it "There was no way anyone named Malen Johnson was getting a job with the lumber company". After being turned away several times, Malen walked a block over to the railroad offices and sat down with railroad president Flake Willis, who gave Malen a summer job on the tie gang. A few days after Malen started, a couple lumber company officials visited Flake and demanded that he fire Malen immediately. Flake refused, telling the officials that Malen needed to learn to stand on his own feet and that he shouldn't be held responsible for whatever problems they had with his dad. Malen firing the #25 in 1969. Roger Titus photograph. 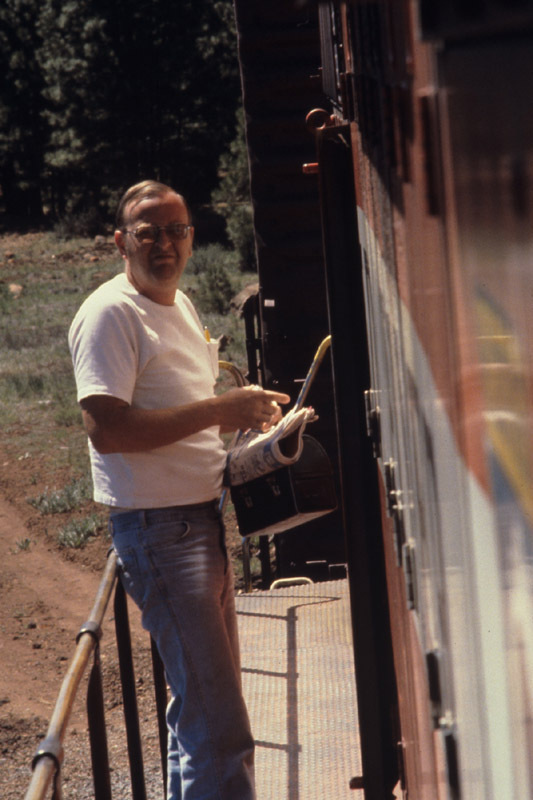 Malen initially had plans to go onto college in the fall of 1959, but as the summer drew to a close the railroad offered him a chance to stay on the section gang on a permanent basis. On October 24, 1959, Malen married his high school sweetheart, JoAnn Hansen. The couple settled in McCloud, though Malen's job occassionally called him to live in the railroad's outfit cars parked at various siding along the line for long stretches of time. Malen remembered those as some lonely times for him. Malen's work ethic and abilities impressed the railroad management, and after a short period of time the company promoted him to a crane operator. One of the section bosses drove him out to Obie one day, where one of the company's Burro cranes had been left to remove one of the sidings. After giving him a few pointers, the bosses left him alone to figure out how to work the crane. It did not take Malen long to get the hang of it. Malen firing the #25 in 1975. Mike Devlin photograph, Travis Berryman collection. Malen's first period of employment with the railroad only lasted a couple years, at which time he figured it was time to learn a trade. Malen left the railroad and went to work cutting meat in a supermarket. The diversion lasted three years, at which time Malen rolled up his knives and came back to the railroad. The railroad put him on a steel gang replacing rail up around Signal Butte; by the end of the first day he had his crane operator job back. 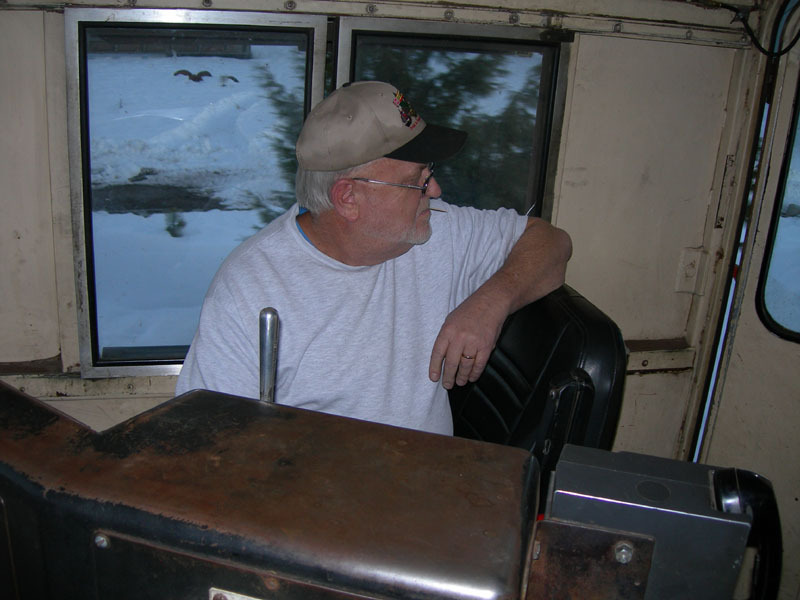 Things moved quickly for Malen after that; he had not been back long before the company started him in train service, a trade he initially learned on some of the last runs of the Burney switcher. By the end of the 1960's the railroad started breaking him into engine service, and he received his engineer qualifications in 1969. Malen's first solo trip came in the spring of 1969, when he delivered the Southern Pacific rotary snowplow #208 back to its owners at Mt. Shasta City. Malen in 1980. Louis K. Thelen photograph. Malen and JoAnn continued to live in McCloud. The couple had three daughters, and in the late 1970's the family purchased a vacant lot next to the lower end of the McCloud yards, upon which they built a new house. They had just finished construction when Champion International closed the McCloud mill, decimating the McCloud community and robbing the railroad of three quarters of its revenue base; however, the railroad struggled on with the remaining traffic, and all engineers on the payroll with higher seniority than Malen retired, leaving him at the top of the roster and therefore gainfully employed as the company furloughed everyone else. Servicing the #25 in 1998. Jeff Moore photograph. The railroad barely survived the dark days of the early 1980's and eventually returned to more sound financial footing as the company found new traffic sources. 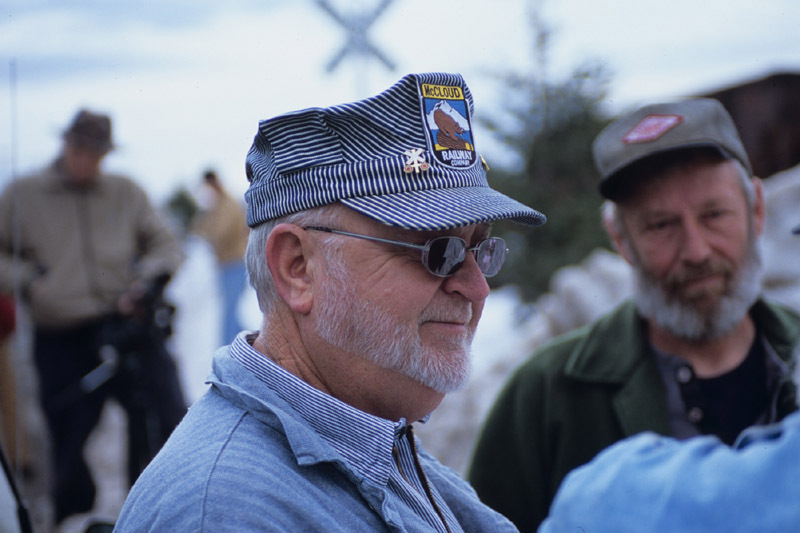 Malen secured continued employment when the McCloud Railway Company took over the property in 1992, becoming the head of the transportation department with the new company. While running trains remained Malen's primary occupation, the relaxed work rules occassionally called for him to work in other areas of the company, particularly the shop and some maintenance-of-way chores. 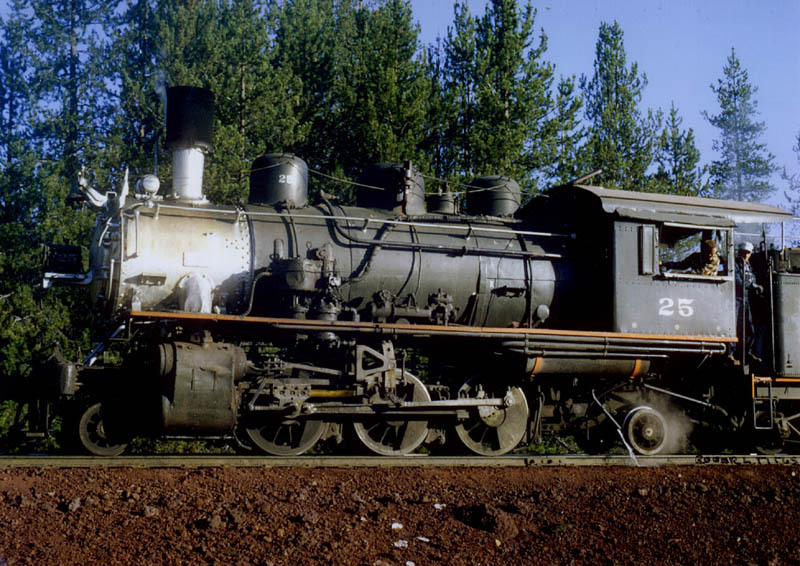 Railfan interest in the McCloud railroads came and went, largely in connection with the sporadic operations of the #25. Malen often found himself firing the locomotive during the late 1960's, early 1970's, and early 1980's, job that often robbed his family of weekends together with minimal pay for the time worked. 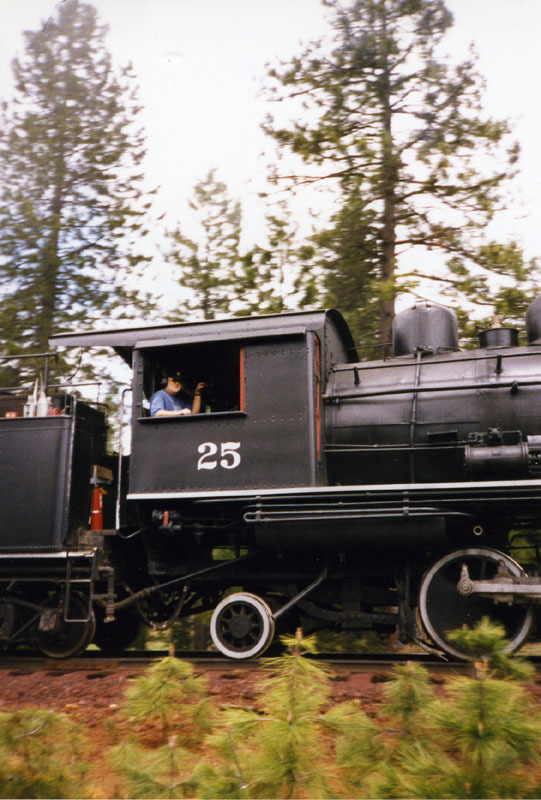 When the McCloud Railway returned the #25 to service in 1997, Malen shifted over to the right side of the cab for the first substantial time in his career, as his only real experience with running the #25 prior to that point had been during the filming of Stand By Me in 1985. The revival of the steam excursions, coupled with the launch of the Shasta Sunset Dinner Train, thrust Malen onto the public stage. Running the #25 in 1998. Jeff Moore photograph. 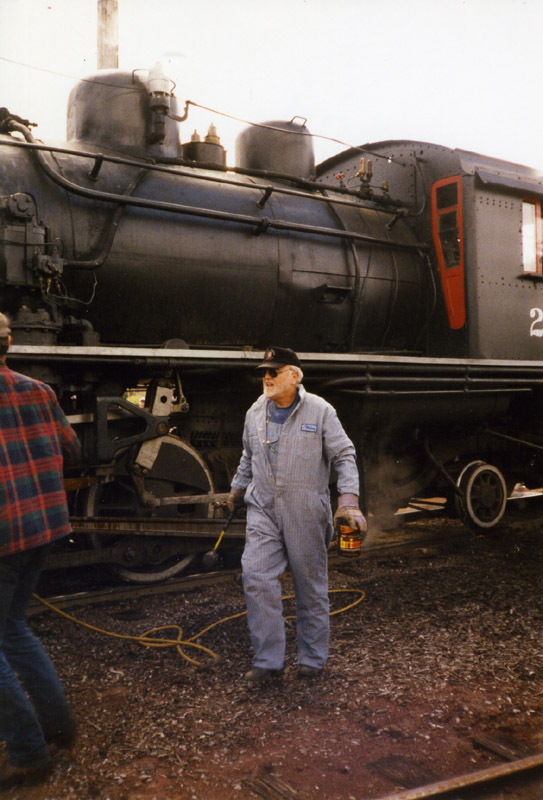 As the 2000's dawned, Malen shined as he became to a new generation of railfans what previous McCloud icons like Ray Piltz and Jack Jordan had been to the enthusiasts of their time. 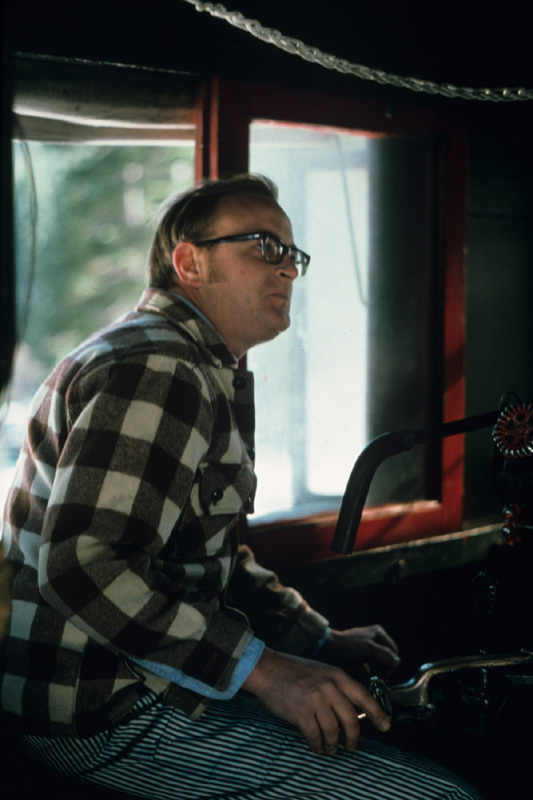 Mondays through Fridays would find Malen climbing on board the diesels to keep the freight moving over the line, while on the weekends he would put on the striped overalls and play the roll. While Malen didn't exactly always see his world through railfan eyes, he became the consumate showman, learning what "the fans" wanted and then doing all in his power to deliver the show they paid to come see. When not running trains, Malen lived an otherwise rich and full life of such things as tending to his garden and lawn, wood working, cutting firewood, sharing time with JoAnn on their wide porch, traveling to visit his daughters and their families, and working on an endless stream of vehicles, mostly older Toyota pickups. Malen in hog heaven. Roger Titus photograph. Malen's working career with the railroad spanned forty one and a half years. 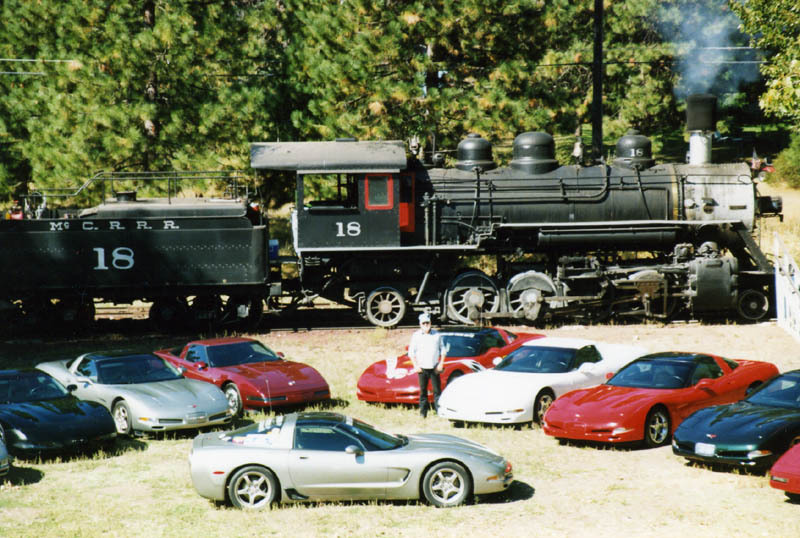 On 31 August 2003, Malen worked a rare weekend Yard & Hill job to deliver loads he brought from Burney the day before and return to McCloud with a fresh set of empty cars. After the empties had been spotted in the yard, Malen and his engines ran through a special Last Run banner stretched across the tracks in front of his house, after which he put the power away and called it a career. His retirement did not mean a complete break from the railroad, however, as like Ray Piltz before him Malen continued to run the steam locomotives and occassionally the dinner trains when the regular engineers could not make it for one reason or another. He and JoAnn celebrated their 50th anniversary in October 2009; unfortunately, JoAnn lost her long battle with cancer a few months later, and Malen brought her ashes out to watch the #25 leave town for the final time as, in his words, she "had always hated those damn steam locomotives". Malen had subsequently fallen in love again and was two weeks away from getting remarried at the time of his death. Malen on the old Lakin siding on one of his last Lookout jobs before retiring. Roger Titus photograph. My own friendship with Malen started in the early 1990's. He knew us from several years of us waving to him in the Burney area. Malen had the job every kid who hangs around on the railroad wants- engineer, top of the seniority board. Malen was one of the most honest and down to earth people I have ever known, and he was a great source of wisdom and inspiration through my youth and into my young adulthood. I passed through McCloud a few days after his passing and contemplated a world without Malen holding court on his front porch with a warm smile and a cold drink for new and old friends alike. Malen will be deeply missed by all who knew him. May he rest in piece.